While Major League Baseball’s tradition of selecting the All-Star Game’s Most Valuable Player to recognize the most outstanding performer in each year’s game, didn’t begin until 1962, baseball historians and knowledgeable fans agree that Ted Williams personified the MVP spirit. 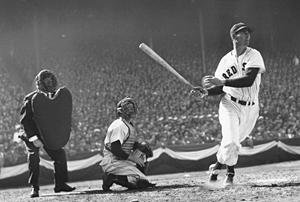 More than six decades before Major League Baseball named the All-Star MVP Award after 500 HRC standout Ted Williams in 2002*, The “Splendid Splinter” sent the 1941 Mid-Summer Classic crowd into a frenzy when he belted a game-winning 3-run blast in the bottom of the ninth. Along with helping to raise $63,267 for the United Service Organization (USO) - the equivalent of nearly $1 Million in 2009 dollars - Williams raised the bar by which all future All-Star MVPs would be judged. Williams continued his All-Star Game heroics in 1946 when, after serving three years in the Marine Corps, he returned to the game he loved and went 4-for-4, homering twice and driving in five runs to lead the AL to a 12-0 victory at his beloved Fenway Park. Perhaps the most memorable moment of the ’46 contest was when Williams challenged Pittsburg’s ace Rip Sewell's to throw his notorious Eephus pitch. The first time Sewell threw it for a strike. Williams challenged Sewell again and hit a home run, much to the delight of the crowd. * Created in 1962, the All-Star MVP Award was originally called the Arch Ward Memorial Award after the man who created the All-Star game. The name was briefly changed to the Commissioner's Trophy, but was renamed “The Ted Williams MVP Player Award” in 2002 to honor the former Boston Red Sox legend who had died earlier that year. The 1971 All-Star Game in Detroit, Tiger Stadium served as a perfect stage to spotlight the power of future 500 Home Run Club members Reggie Jackson, Harmon Killebrew, Frank Robinson, and Hank Aaron who all hammered home runs in the last All-Star Game played at Tiger Stadium. 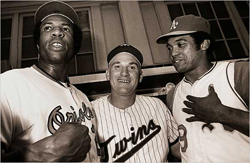 Three of the game’s all-time leading home run hitters: Willie Mays, Mickey Mantle and Ted Williams all homered in the 1956 All-Star Game played in Washington’s Griffith Stadium to lead the NL to a 7-3 victory. 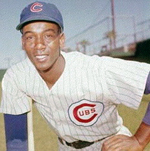 Mr. Cub Ernie Banks made the first of 15 All-Star appearances in the 1960 All-Star game. 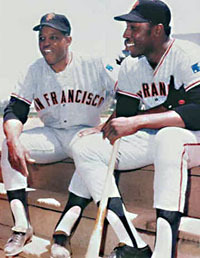 Fellow 500 HRC member Willie Mays collected a single, double and triple, but it was the young shortstop who stole the show with a timely double and a game winning two-run homer in a 5-3 NL victory. Banks ended the season leading the league in HR for the second time, with 41. In 1981, at Cleveland’s colossal Municipal Stadium, 500 HRC member Mike Schmidt smacked a two run shot in the eighth off Rollie Fingers to secure the win before a record crowd of more than 72,000. ** First time in All-Star history that three 500 HRC members formed the starting outfield.